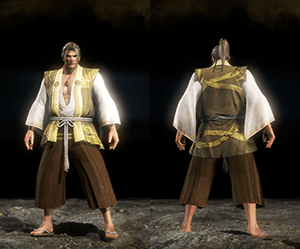 Yagyu's Shinkage Style is a Set in Nioh. Can be obtained from the Training Mission: "Zen and Sword are One" in the Dojo as a reward. Can drop from Revenants of players who have acquired pieces of this Set. Can also drop randomly from missions in later regions. Great 3 piece bonus if you get the set reduction magatama and use the sword with the chest piece. Possible to combine with kingo set boots, gloves, helm, and sword, with pants from another set of your choosing to get another bonus. Bonus points for incorporating warrior of the west through the bow, and yatagarasu via the rifle.